Big John McCarthy's New Memoir Hits Store Shelves Today! 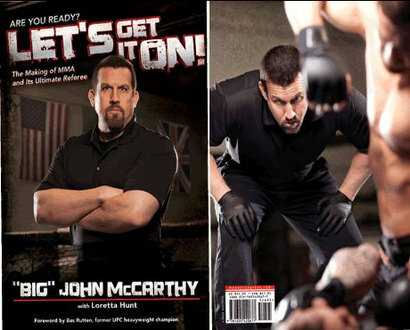 You are here: Home»MMA News»Archive»UFC | MMA | News | Rumors| Blog»Big John McCarthy's New Memoir Hits Store Shelves Today! CHICAGO, September 1, 2011: Called "One of the best books ever written about the sport," by SBNation.com, "Big" John McCarthy's new memoir, Let's Get It On! : The Making of MMA and Its Ultimate Referee (Medallion Press), officially hits bookstores today. With his signature phrase, "Let's Get It On!," "Big" John McCarthy has officiated the biggest and bloodiest fights in the history of the Ultimate Fighting Championship (UFC) and mixed martial arts. A sport that's grown into a multinational, multibillion dollar business, very few have been a part of it from its very first match. But with McCarthy's impressive 17-year history as the sport's top official, he became an integral voice in its regulation and as a firsthand witness to MMA's ongoing struggles to gain widespread public acceptance. In his new memoir, Let's Get It On! : The Making of MMA and Its Ultimate Referee (Medallion Press, September 1, 2011) by "Big" John McCarthy with MMA journalist Loretta Hunt and a foreword by former UFC heavyweight champion Bas Rutten, McCarthy gives fans a rare view from inside the Octagon as he recounts the sport's initial tribulations and confronts his own legacy as its longstanding, legendary referee. The son of a police officer, McCarthy inherited authoritative instincts that would prove invaluable both in his 22-year career in the LAPD and inside the fast-paced, intense arena of the cage. The first, full-length autobiography of the pop culture icon, Let's Get It On! traces McCarthy's childhood, his impressive police career and his initial forays into martial arts under the direction of UFC creator Rorion Gracie, who originally appointed McCarthy to referee. A fixture of the sport, McCarthy began refereeing in 1994 at UFC 2 and went on to officiate every major UFC event except two until 2007. Let's Get It On! gives a no-holds-barred account of the UFC and the sport's early struggles and "Dark Ages," including McCarthy's involvement in naming the sport and creation of its original 17 rules; the stalwart efforts to legitimize the sport; and the purchase of the business by the sport's current owners—brothers Lorenzo and Frank Fertitta, co-owners of Zuffa LLC—just before UFC 30 which led to the sport's public revitalization. An action-packed and riveting read, Let's Get It On! also includes a fight-by-fight account of the sport's greatest matches and rivalries: the feud of Tito Ortiz vs. Ken Shamrock; the trilogy of fights between Randy Couture vs. Chuck Liddell; the return of UFC great Royce Gracie at UFC 60; and the record-breaking UFC 68 which featured Randy Couture vs. Tim Sylvia. McCarthy also addresses his decision to retire from MMA refereeing in 2007, his highly anticipated return to the UFC in 2010 and his ongoing involvement in the expansion of MMA worldwide. Let's Get It On! is available now. Buy it at IPG, Amazon, Barnes & Noble and nationwide wherever books are sold.